What have Box, Dropbox, Nest, Evernote, Cloudera, Palantir and Instagram in common? They were all designated a Cool Vendor by Gartner. So, what happened to the Cool Vendors? We identified over 1250 tech companies that were nominated as a Cool Vendor by Gartner. We surveyed some of them to evaluate both the impact the designation had on their business and how they work with industry analysts. 232 CMOs and CEOs responded from these emerging technology companies from all over the world. As thanks for their candour and collaboration, we gave them copies of our book on analyst relations. The results provide a unique view of the business impact and perception of analysts’ value to emerging businesses. The context for the survey is our long interest in the business value of industry analysts. So what is that value? In our opinion, influencer marketing investments (including analyst services and analyst relations) have to move the needle. Business value means higher margins, through more revenue, faster deal flow or reduced risk. There is a chain of interactions and relationships behind this value creation. Mutually beneficial relationships with industry analysts are potent multipliers. Analysts create business value through contributions to strategy, product development, marketing, sales, and the abilities to attract and retain talent and capital. The question on your mind right now probably is: “were these companies cool before Gartner said they were, or is there a ‘Gartner factor’ here”? Was it already a good company with above average potential or did it become better because of analyst recognition? It is really hard to prove any causality there and we did not try to with this survey. However, the following results give an excellent impression of how the leadership of Cool Vendors has experienced the impact on their businesses. It is interesting to see which companies are independently growing, which have died and how many of the Cool Vendors are acquired. Cool Vendors operate in a very dynamic environment. Late in 2016, 2014 Cool Vendor Brite:Bill was bought for a cool €70 million. Not bad for a firm founded in 2010. Our research shows that at least 5% of Cool Vendors have closed. Comparing that to the startup success rate from venture capital, CV’s have much bigger success than the average young technology firm. Despite the cry that 2015 would be the year of the dead unicorn many firms that failed to IPO, such as Evernote, were still able to find a way forward. Over 15% of the Cool Vendors have been acquired, including high-profile acquisitions, such as Instagram, Yammer and Nest. Most of the active acquirers are our usual suspects: Microsoft, Apple, Oracle, Salesforce, Juniper, Google, IBM and Facebook. These tech giants are often snapping up multiple Cool Vendors. If we zoom in on the 2009 Cool Vendors which represent the oldest Cool Vendors we surveyed, there is an interesting pattern. In 2009 12% of the Cool Vendors was acquired. Almost a third (32%) of these acquisitions occurred in 2010, the year after the companies where nominated Cool Vendor. Another 23% of the acquisitions occurred in 2011, followed by 21% in 2012 and 12% in 2013. So there is a big spike in 2010, trending down in the following years. Taking into account the numbers of failed and acquired Cool Vendors means that many still out there as independent companies, either private or public. Box succeeded with its 2015 IPO. Dropbox won a huge line of credit to support an IPO in 2017, and Palantir is reportedly pondering one too. That said, much smaller and less well-known vendors are also punching above their weight. 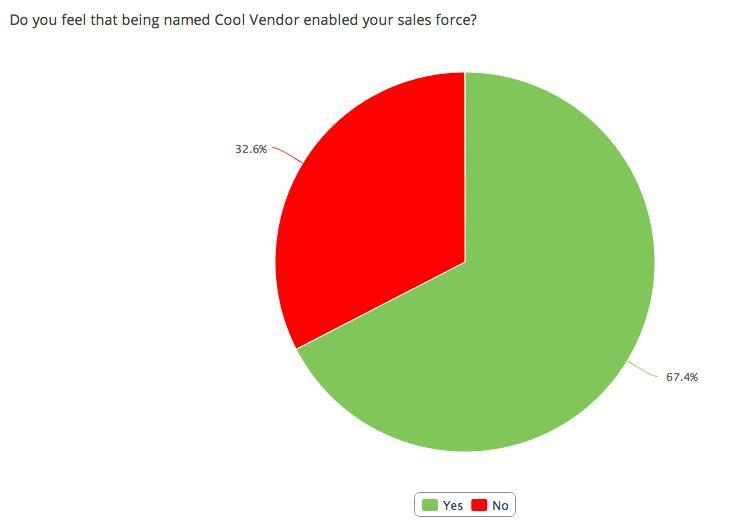 * What did being named Cool Vendor (i.e. analyst recognition) bring your company? * Was it a result of an Analyst Relations effort? Analyst Relations plays an important role for many Cool Vendors. 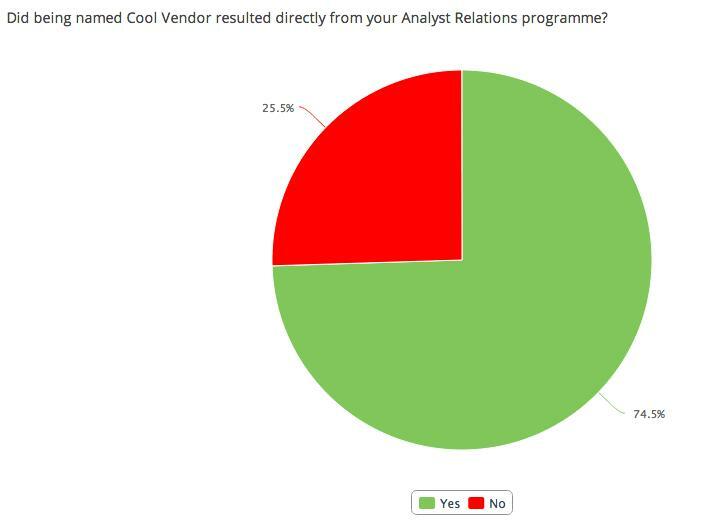 Over a quarter of respondents report having had proactive Analyst Relations efforts with Gartner in the year before becoming a Cool Vendor. And 28% say they were proactive in engaging other analysts as well. Although 46% of the respondents said their analyst relations efforts in the year before becoming a Cool Vendor were purely reactive, 75% directly attribute their nomination to the ongoing Analyst Relations program they put in place. Three-quarters of the leaders in these companies say AR directly led to recognition. For AR professionals and tech vendor leadership, that is a very powerful conclusion. Since AR is often viewed as a part of marketing, the first place is obvious. Sales as the next logical field that benefits from analyst recognition. We see this interest, but also the struggle vendors have, in our practice at Kea Company, where many engagements are focused on sales enablement. 67% of Cool Vendors report that their sales force was enabled to be more effective and successful by the Cool Vendor nomination. Attracting money and talent are areas where the business impact is less obvious according to our respondents. In both cases around 60% do not see an effect and around a third reporting some effect. You can look at the impact on these areas as secondary benefits. Growth and visibility in the market are two areas that substantially benefit from analyst recognition in the form of Cool Vendor nominations, with a quarter reporting quite a lot of effect on visibility. Almost a third contribute 5% or more of their business growth to being a Cool Vendor. With 4.5% even reporting over 15% of growth. These are numbers that technology providers should not ignore, or do so at their own peril. 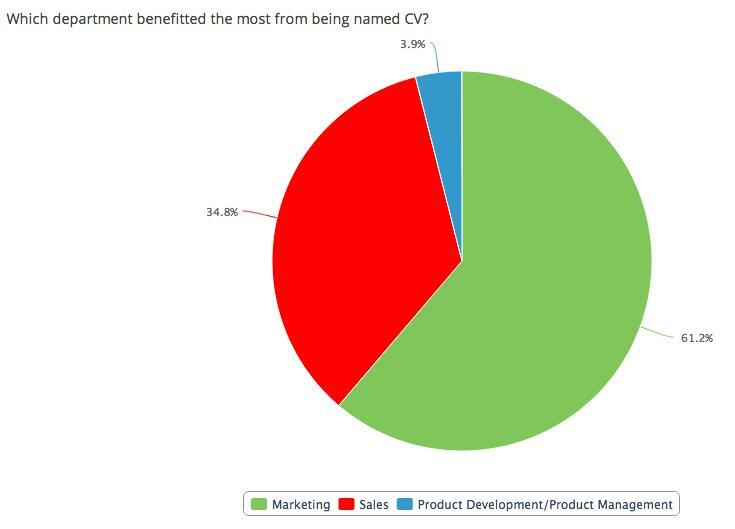 Analyst recognition leads to substantial business growth according to founders, Chief Executive Officers and Chief Marketing Officers of Gartner Cool Vendors! More than half of the Cool Vendors have been mentioned in research by other analyst firms as a result of Analyst Relations efforts. Our respondents explicitly say there is a positive relationship between receiving accolades from industry analysts and quantitative (e.g. higher sales) as a qualitative (e.g. more brand recognition) impact on their businesses. This success doesn’t come easy though. Most firms have a proactive approach to relationships with industry analysts. Building a relationship takes time and effort. It is like real life; no one met his or her partner and instantly had what we would call a relationship, let alone a profound and meaningful one. Dating means getting to know each other, spending time together and creating memories. We all know it takes two and a relationship is not something you take for granted. This long-term perspective sounds romantic, but the analogy is as true for business relationships as well. We chose to research Gartner Cool Vendors because this is the best known and most consistent research program run in consecutive years, that is aimed to investigate a broad range of emerging technology areas and high potential companies, specifically including small and medium-sized vendors. This time series and the inclusion of tech firms in different stages of development and growth provide a spectacular view of up and coming tech businesses and the impact that industry analysts can have. Analyst Relations is a discipline that – if done well – can have a series of effects that lead to business growth and success. This survey of Cool vendors shows that and also that there is room for improvement because is an opportunity that is underutilised. Firms can leverage analyst relationships, and the results of those relationships, better. Analyst Relations professionals have to learn how to tie AR outcomes to business outcomes. That way CEOs, CMOs and other people in leadership positions at tech vendors can use analysts and AR better to reach the companies’ full potential, quicker. Working with analysts can help to adopt an outside-in perspective that is so important in today’s customer experience focussed business ecosystem. Tech vendors should notice this impact and realise that there are more analyst firms besides Gartner, way more. That means they have a lot more opportunities to create. Being aware of the benefits of mutually beneficial relationships with the relevant analysts is the first step. Setting up an Analyst Relations program that enables and drives these relationships is the next step. If marketing and sales departments are capable of making the most of analyst recognition, tech vendors can really create competitive advantages that drive commercial success. This 2017 post is our researchers’ update of a 2014 note by Derk Erbe. To see more up-to-date data on Cool Vendors, see this presentation by Duncan Chapple to the 2018 Cool and Hot Vendor Forum. ← Do layoffs at 451 Research reflect lower value?